The role and capacities of the military are critical elements of a modern state. In functional democracies, the military’s institutional boundaries are tightly prescribed, excluding it from the political arena. It must be both trusted and adequately resourced to effectively discharge its mandate of protecting the country from external and internal threats. Recent events in Zimbabwe thrust the military into a bright spotlight. For the first time since independence in 1980, Zimbabwe in November 2017 experienced overt military intrusion into the country’s politics. While denying that it was taking over the government, the military stepped into protracted wrangling over possible succession to long-time President Robert Mugabe, in a series of dramatic events that culminated in Mugabe’s resignation (Al Amir, 2017; International Crisis Group, 2017). How does the Zimbabwean population see its military? 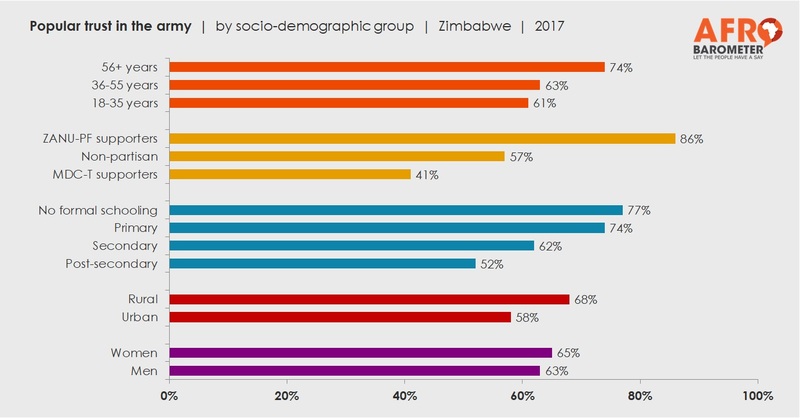 Afrobarometer survey data collected in early 2017, months before the unexpected events of November, show considerable public trust in the army, but also fear of criticizing the army along with a clear rejection of military rule as an option for Zimbabwe. Citizens think the army is generally capable of protecting the county from external and internal security threats, but there is substantial skepticism about soldiers’ training, equipment, professionalism, and respect for citizens’ rights.